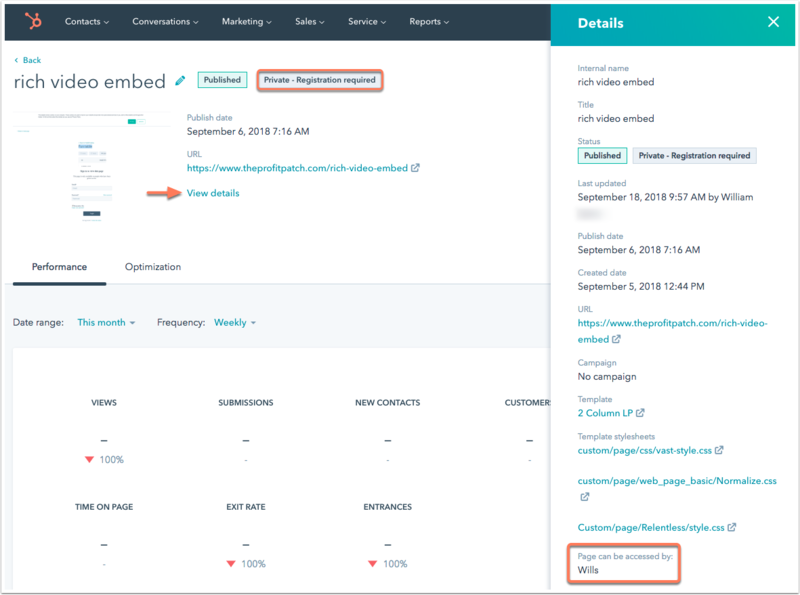 Marketing Hub Enterprise users with publish permissions can control audience access for HubSpot-hosted pages and blogs. You can set a password or require a list of your contacts to register to view your content. Learn how to understand the private content a contact has access to. Making a page or an blog private does not encrypt its content and shouldn't be used in place of user accounts or to hide sensitive data. Password-protected content won't be crawled by search engines. If you've recently restricted access to content that was previously publicly accessible and indexed, it may take search engines some time to de-index the page, but it will still only be accessible to those who have been granted access. This feature only works with connected subdomains and will not work on the default subdomains that come with your HubSpot account (i.e., hs-sites.com subdomains). If you enable membership access to a page hosted on a default subdomain, registration emails won't be sent to your contacts until after the page is published on a connected subdomain. The language of the registration email is set by the default account language. If a contact tries to a view content without access, they'll see a message that states they don't have access. The page will includes a link to email an administrator in your HubSpot account, and a link at the top to return to the previous page they were viewing on your website. You can customize the audience access to a page in the page editor or in the pages dashboard. In the page editor, click the Settings tab. Public: this is the default setting. This allows anyone to see the page when it's published. Private - Password required: restricts access to the page to visitors with a password. Enter a password that anyone can use to view your content. Private - Registration required: restricts access to the page to only registered contacts in specific lists. Click the dropdown menu and select the checkbox(es) next to the list(s) of contacts that will have access to this content. These contacts receive an automated registration email to create a password to view this page. Click Save or, if you've selected Private - Registration Required, click Save and send email. This action sends a registration email to any contacts who haven't already registered for customized content access. Please note: if a contact doesn't receive the registration email, they should add noreply@domain.com (the domain your private page is hosted on) to their address book or whitelist your sending IP addresses. Then you can resend the registration email to them from the contact record. Contacts will be prompted to register and log in when they visit a restricted page URL. After logging in successfully, HubSpot adds a cookie to the visitor's web browser, and they won't be prompted to log in again. Hover over the page, click the More dropdown menu, then select Control audience access. 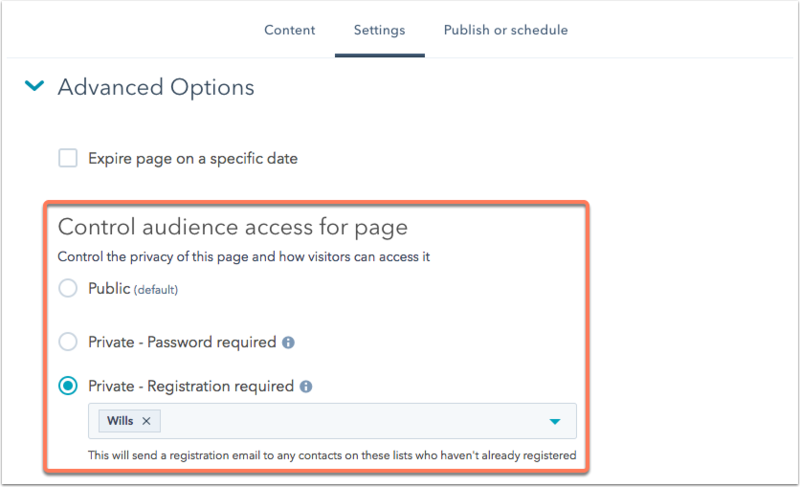 To control audience access in bulk, select the checkboxes next to the pages to limit access to, then click Control audience access at the top of the table. For landing pages and website pages, audience access appears in the dashboard below the page name. In your HubSpot account, navigate to your landing pages, website pages. Click the name of a page to view further details on its access restrictions. 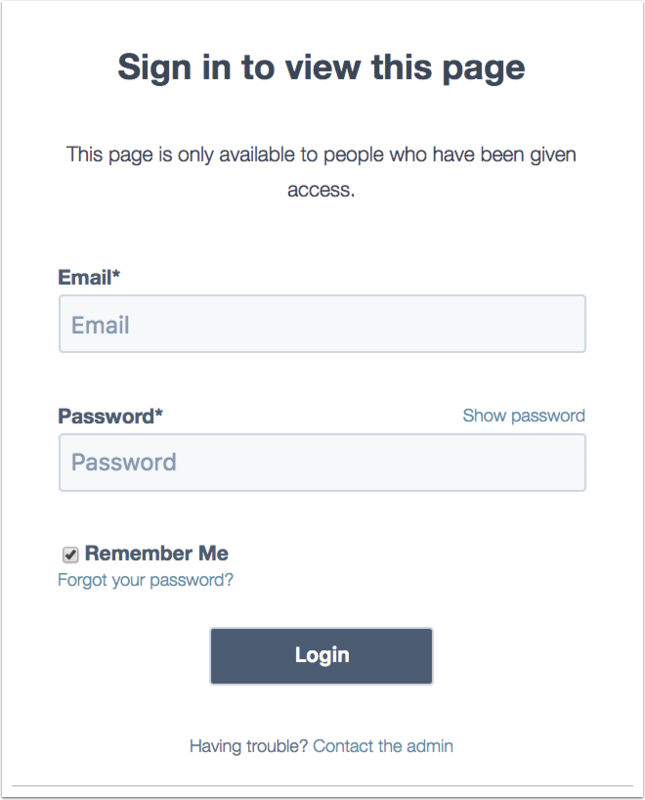 On the page details screen, a label at the top of the page indicates if the page is private and requires a password or registration. If the page requires registration, click View details to see which lists that have access to the page. 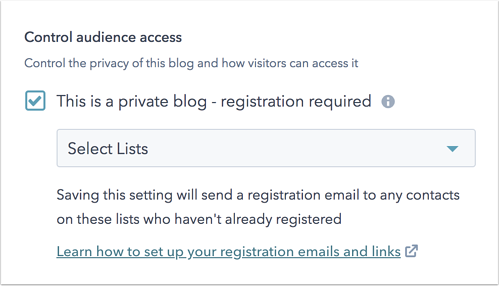 You can set your blog to private and require a list of contacts to register for access. To choose the blog you want to customize access for, click the Select a blog to modify dropdown menu in the upper left. On the General tab, select the This is a private blog - registration required checkbox. Click the Select Lists dropdown menu to choose the list(s) of contacts who that will have access. This action sends a registration email to any contacts who haven't already registered for customized content access. Click Save to apply your changes. This action sends a registration email to any contacts who haven't already registered for customized content access. In the left sidebar menu, navigate to Private Content. Company name: the company name that appears on these page templates. Website admin: enter the email address for visitors to contact if they have trouble logging in, logging out, or registering. In the Default destinations after each action settings, select the redirect page after visitors register, log in, or log out. If the visitor clicked a link to see a specific password-protected page, they'll be directed to that page instead.